Eating with the season is the best way that I can describe this salad. My husband’s best friend brought over a large tray of freshly picked strawberries over the weekend and this salad immediately came to mind. 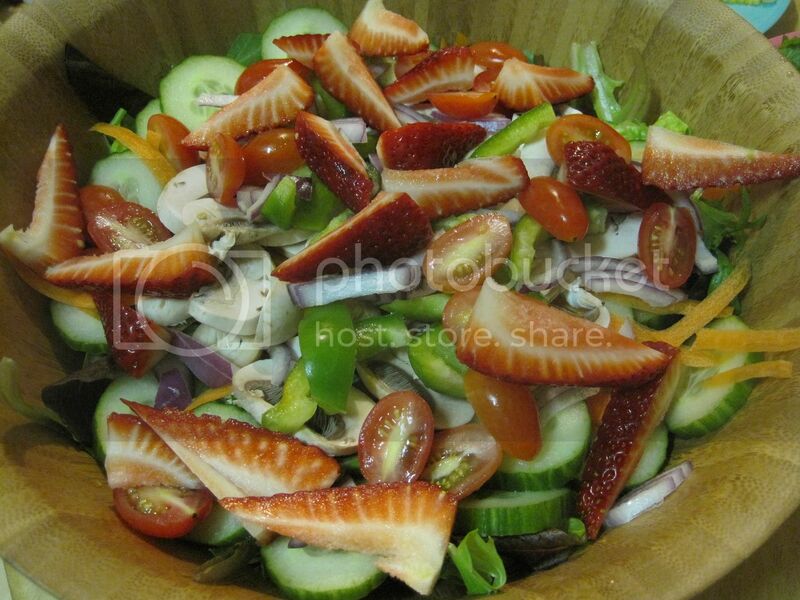 My girls have been into adding fruits with our green salads lately and what with strawberries and corn being in peak season right now, I thought I might as well post this recipe even though I don’t usually post salad recipes. Well, if you think about it, there really isn’t a recipe is there? When I put a salad together, it all depends on what’s in the fridge, the garden or the fruit bowl. I always thought salad recipes are self explanatory. You can see what’s in it, but given the number of comments on my main blog when I posted a photo of this salad asking for the recipe, I suppose I might as well. 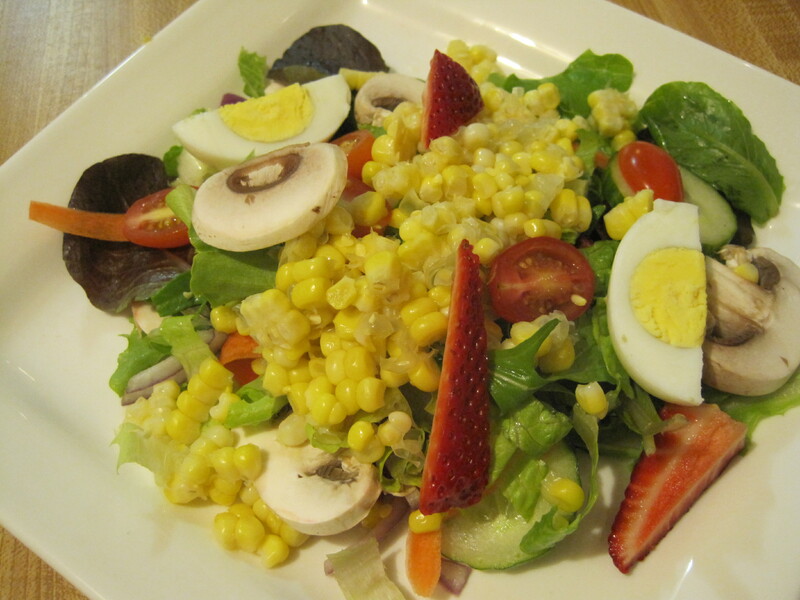 This salad uses fresh corn and freshly picked strawberries when they are in season. 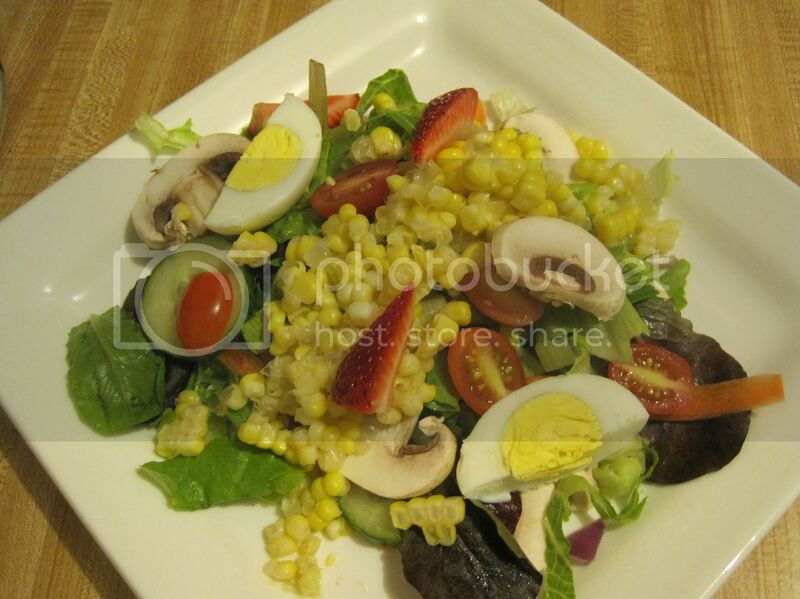 Place all of the ingredients above in a salad bowl except for the Corn and Eggs. Plate the salad and top with a few spoonfuls of corn and egg. Dress with your choice of dressing. I didn't add a dressing recipe for this because everyone at my house have a preferred dressing; Some people can't get away from ranch and others just have to have Asian Dressing on everything. So use whatever salad dressing works for you and your family. For me, a simple drizzle of olive oil and a generous spritz of lemon with a sprinkling of salt and pepper are just enough to waken the flavors. If you can get fresh corn like we can right now, and they are as fresh and sweet as they can get, you can just take them off the cob without even cooking them! My girls and I don't mind eating raw corn. However, in a pinch, canned corn or frozen corn will work with this salad too. Finally, this is a salad so the measurements are not exact. Just throw in a handful of this and that. The measurements I wrote above are approximates only as I rarely measure when I'm making a salad. JMom, the mushrooms are raw too?